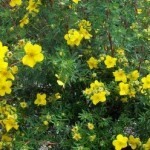 A fine textured, small shrub with bright yellow, single blooms in late spring through fall. The foliage is a dark green. It adapts well to poor, dry soils. 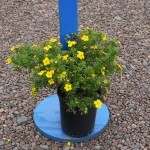 It is useful in the shrub border or for mass planting. Prune when needed to keep a tidy form.